Do IT Problems Plague Your Business? IT security problems come in many shapes and sizes and have a tremendous impact every day on how effectively and efficiently a business operates. Data breaches. Network outages. Productivity losses. These are all daily occurrences in the IT world, and dramatically impact the activities of businesses and consumers around the globe. • Noncompliance and Security Risks. Ask yourself: are you complying with regulations mandating data security and network integrity? Are you managing security risks and safeguarding data from fraud, theft and misuse? • Downtime Impact. Are IT disruptions distracting your staff from their core focus, or prohibiting them from working efficiently? • Distracted Employees. Does your staff turn to and interrupt non-IT employees to deal with recurring IT problems? • Neglected Network. Is your network perceived by employees as just a “necessary evil” and not as an integral part of improving business performance? • Time-Consuming Server/Backup Checks. Is it necessary for your staff to routinely check network servers and backup systems on a daily basis? One of the major challenges in maintaining a computer network today is trying to predict what will fail and when. Because of this, it is imperative that work be done to prevent networks from failing in the first place. Through the combination of regular and comprehensive preventative maintenance and robust, real-time monitoring of critical network and desktop devices, the reliability and stability of IT assets can be sustained. Building a program that relies on 24x7x365 automated network monitoring, coupled with an aggressive preventative maintenance component, ensures optimum uptime for a business. 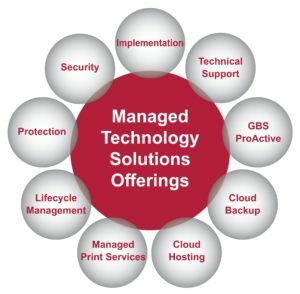 GBS’ ProActive solution does all of these things and more! Our ProActive solution is so effective that customers see almost immediate results. A regularly maintained network means fewer failures, yielding higher productivity and savings on support costs for businesses. At the same time, exposure to security risks is dramatically lessened and frustration from unstable IT resources almost vanishes. ProActive allows businesses the time and freedom to focus on their core business functions by taking the worry out of owning a computer network. To learn more about ProActive and the options and benefits available, contact one of our product experts at 1.800.860.4427 or marketing@gbscorp.com or click here.